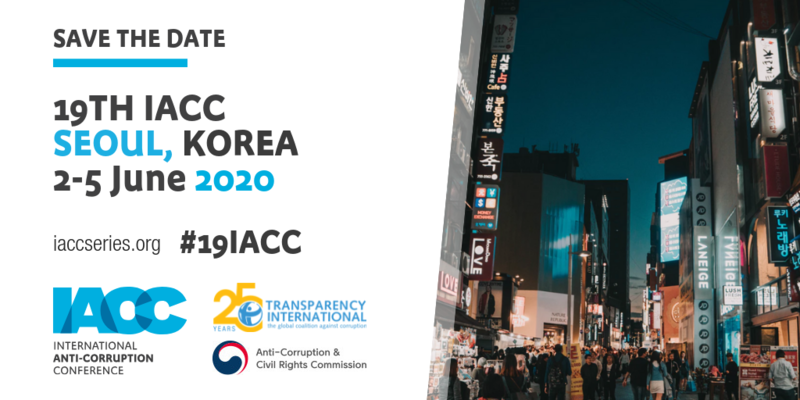 The International Anti-Corruption Conference (IACC) Council and Transparency International (TI) announced that the next IACC to take place on 2-5 June 2020 in Seoul, Korea. “The IACC brings the global anti-corruption community to forge new alliances and strategies to advance in the anti-corruption agenda. It is the world’s most important independent platform. We thank our host the Korean Government, represented by the Anti-Corruption and Civil Rights Commission (ACRC), for their invitation to welcome the anti-corruption movement in 2020.”, said Huguette Labelle, Chair of the IACC Council. The IACC, first held in 1983, has evolved into the leading global forum on governance and anti-corruption. The IACC takes place usually every two years in a different region of the world, and hosts from 800 to 2000 participants from over 135 countries worldwide. The conferences promote international cooperation among government, civil society, the private sector, and bring together leaders from various sectors in the fight against corruption. The 19th IACC is hosted by the Government of Republic of Korea, represented by the ACRC, and organised by the IACC Council and TI, the secretariat to the IACC Council, with the participation of the TI National Chapter in Korea. “We are pleased that after five years the IACC is again to be held in Asia. We look forward to working together with our partners, friends, and new stakeholders to advance the anti-corruption agenda and to stand in solidarity with each other as one global movement.”, said Delia Matilde Ferreira Rubio, Chair of Transparency International. We invite interested countries within the TI Movement to host the IACC in 2022 to read the call and to contact IACC team via [email protected] for more information about the selection process. Latest information and updates on the 19th IACC conference theme will also be shared on our website in the coming months. We look forward to welcoming you in Seoul in 2020. To stay informed, follow us on Twitter and Facebook, and sign up for our newsletter.